Everyone is always looking for the next big trick that will take their hobby/painting quality to the next level with minimal effort, myself included. 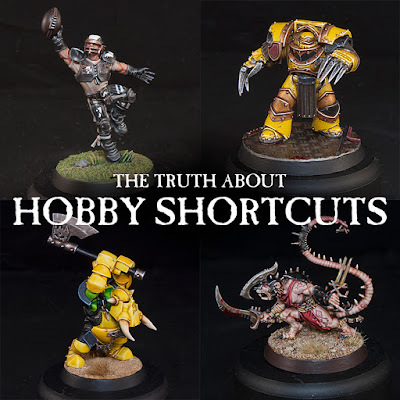 I have recently embarked on a quest to find the best ways to get good looking models with the minimal amount of time put in, but there's more to it than just finding the next great shortcut. I started my hobby way back in the murky mists of time known as 2000/2001. Back then we had half the amount of paints, no foundation/base paints, and no shades. 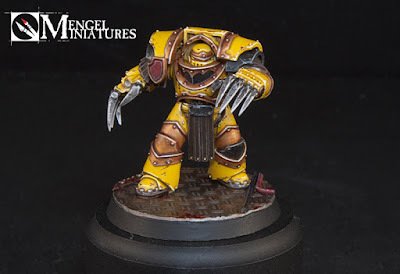 If you wanted to paint an army yellow you had to be prepared to spend the better part of the next decade working on the project due to how long it took. Reds and yellows were extremely thin and took a ton of skill to master. Shades didn't exist yet and the best thing you had were the inks, which had their uses, but were a little too strong and shiny for providing the shadows on your models. When GW introduced the foundation and shade paint range it was a game changer. I remember a lot of painterly people thought of the shades as cheating in a bad way, like it took the skill away. Kind of like how a lot of photographers had a backlash against Instagram at first because it made their chosen skill more accessible to everyone. 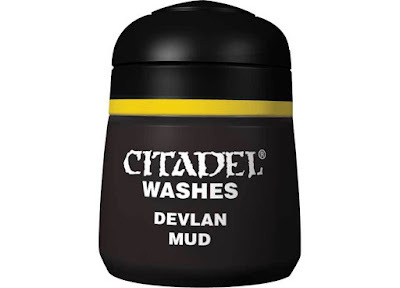 I was a little hesitant to the shades at first, but quickly came to love our new overlord named Devlan Mud. The foundation paints were also huge and made painting certain colors 100 times easier. Suddenly you could paint a Blood Angel or an Imperial Fist and get it done in a reasonable amount of time. For you newer hobbyists out there, foundations paints are the equivalent of what the Base Paints are today. They had a lot more pigment in them meaning you had to do fewer coats to get a solid color. 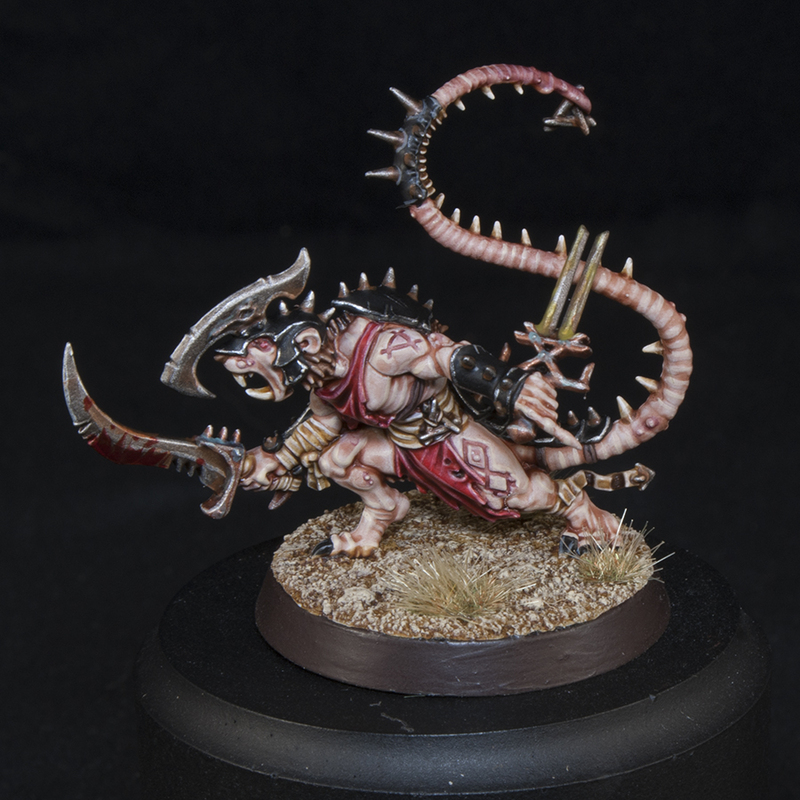 I have recently started to look for even faster ways to paint good looking armies. Very few of these ideas were my own and they were mostly scavenged from other hobbyists and blogs, compiled together, and given my own twist. 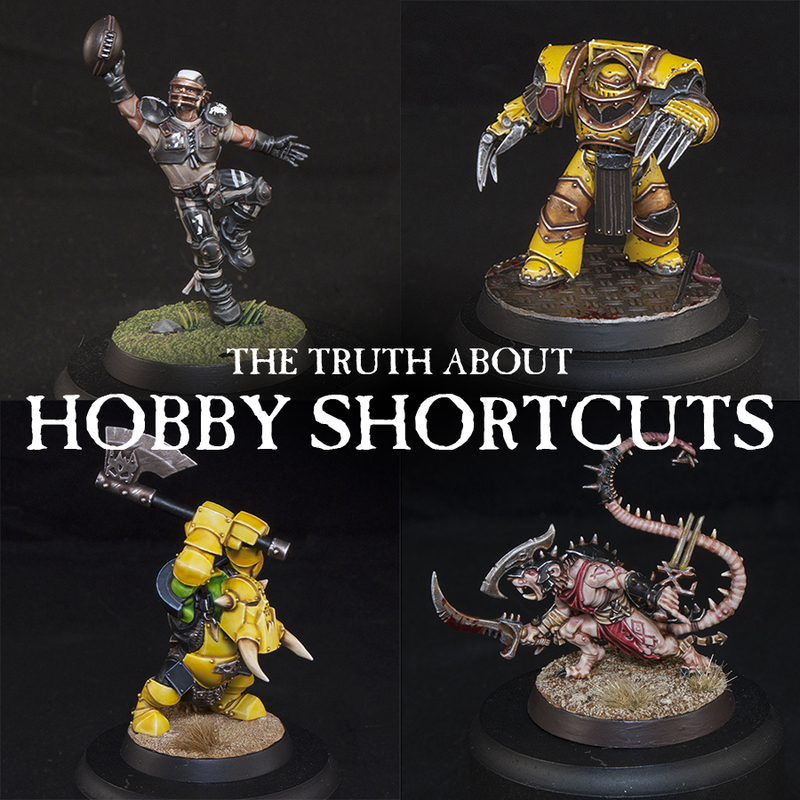 You can see this with my Horus Heresy Imperial Fists Marine and Terminator, Bloodbound Skullgrinder, Ironjawz 'Ardboy, Skaven Deathrunner, and my upcoming Nighthaunt Cairn Wraith. All of these models use some sort of trick that cuts the amount of time needed in half, at the minimum, and drastically reduces the amount of layers needed. I mostly did this by utilizing a lighter base coat, either white or some sort of off-white, and then adding most of the color in with Glazes and Shades. I really like this technique, but it of course only works for certain color schemes. Even so, it's a time saver, and I think everything turned out looking pretty good. There's a catch though. Using these same techniques, you could end up with a mini that doesn't quite live up to what you were expecting. To help explain this I would like to retell a quick story from my days in college. When I went to college my Freshman year I decided to start playing guitar. I mostly taught myself, and I like to think I am somewhat decent now. After teaching myself the basics though I figured it would be worthwhile to invest in some professional lessons. 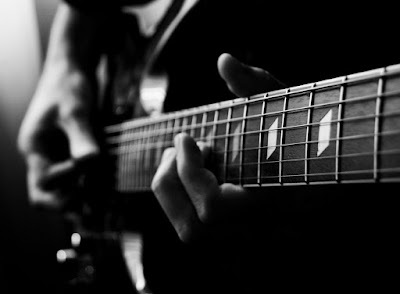 At my very first guitar lesson my teacher pulled out a song by The Police. I can't read sheet music so he had the tabs for it. It was a little too complicated for me, but he showed me a quicker way to play. He played it once following the tabs he gave me, then played it again using a quicker, simpler method. They both sounded more or less the same. Even though there was an easier way to play it he refused to teach me that method. He said that I needed to learn how to play it the proper way and then I could learn the quicker, shortcut method. He said that I needed to do this so I would understand why I was taking the shortcuts I was taking. This is doubly true for painting miniatures. In all of the tutorials I linked above there were a few key techniques that really helped those models look as good as they did. Brush control is a huge one. The crisp highlights really help pull together the "sloppier" method of using glazes and shades. If my highlights were not as controlled as they were then the look wouldn't be as good. 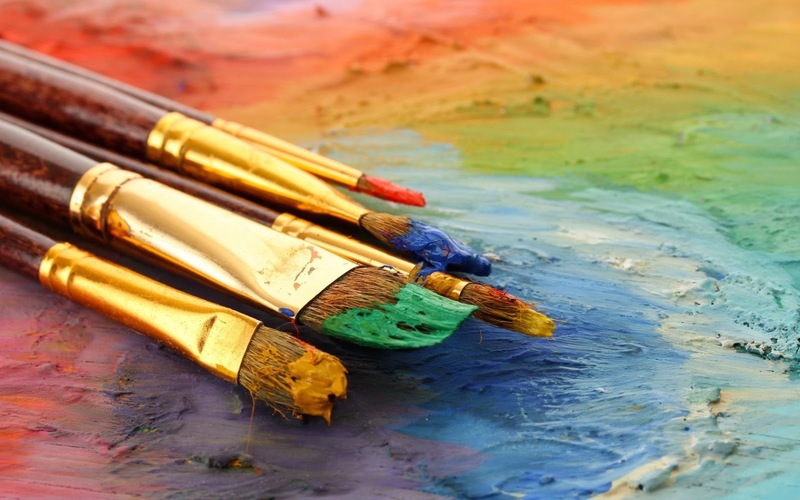 Having a good understanding of color is also essential. This allowed me to know which paint I should use and why. Finally, you just need to have a good understanding of where to place shadows and highlights and where you can get away with something sloppier and where you need to be tighter with your control. You can distract people from a looser paint job if you have a few key areas that you push to a higher standard. All of this, of course, comes from experience. Like I said at the start, I have been in this hobby since about 2000 or 2001. That's 16-17 years of miniature painting experience. There are a ton of quick fix painting tricks out there, including my own that I have posted, and will continue to post. I am in no way saying that you shouldn't utilize these, I am obviously using them, but don't let it be your crutch. A trick is no replacement for experience and hard work. Continue to push yourself and go outside your comfort zone with your painting so that your understanding of the craft grows. 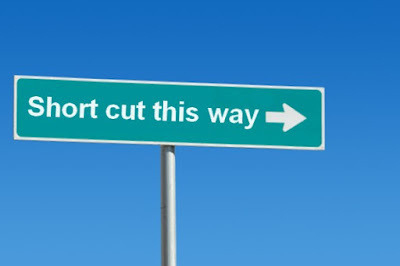 You first should learn how to do it the hard way, then, once you understand what you are doing, you can go back and use the easier, faster way. 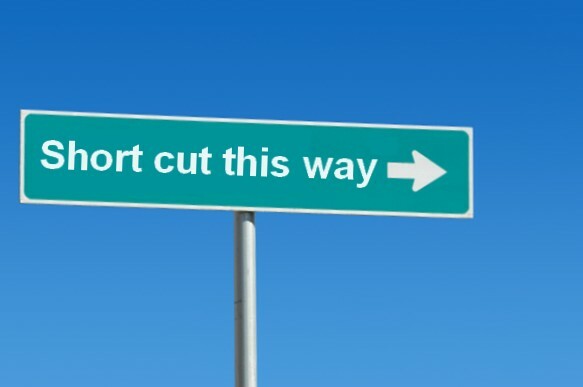 Use the shortcuts, but don't let it hold you back from learning the techniques that underpin it. There's no substitute for hard work and experience in the end.